The other night our family had a picnic. 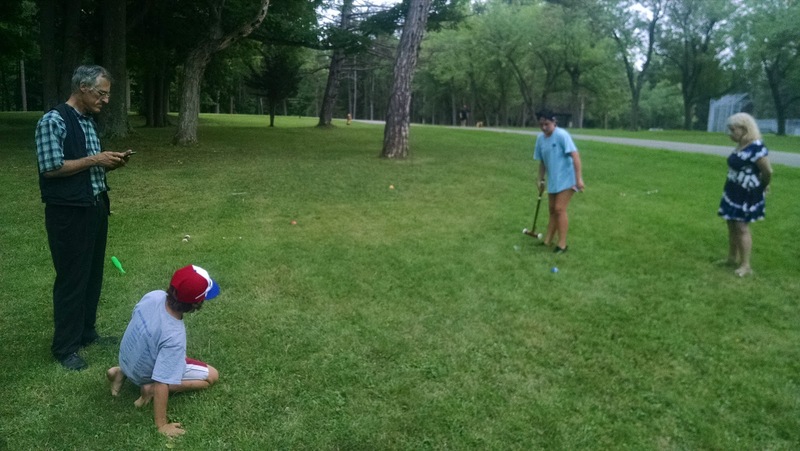 My brother Tony brought a croquet set and after dining in the open air, we played croquet. That is us up above, enjoying our sport. My brother Tony is at left. Fooled you! Actually this is us. From left to right you are seeing my brother Tony, my nephew Georgie, my niece Barb, and Tony's friend Jacquie. You may wonder at Tony's look of grave concentration! It was his job to instruct us all as to the rules and keep the game moving. Not easy! If you could not see the wickets in the picture we could not either. But that is part of the challenge of croquet. 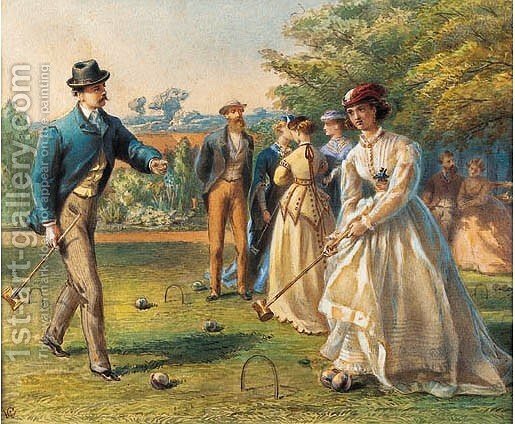 We used to play croquet years ago in our family. 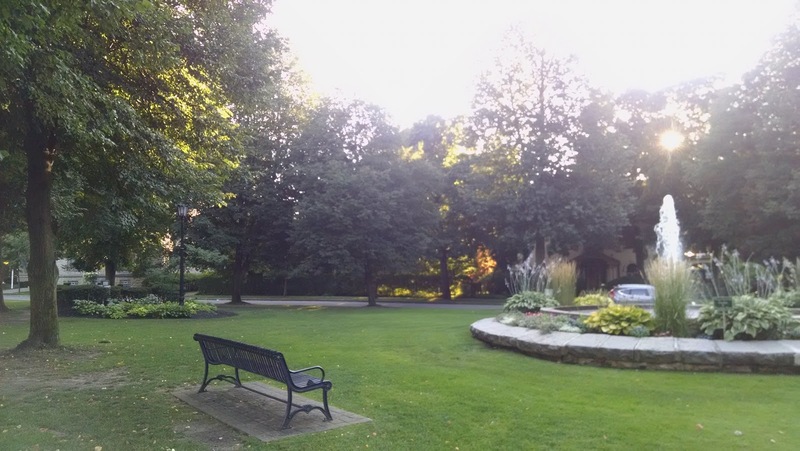 We went to Emory Park in East Aurora, to the exact same location shown in the picture, and would play croquet as the sun was going down. We would play until it was too dark to see. Once Tony, who was about 12 then, missed a shot and he threw his mallet into the air in frustration. My dad filmed it on this camera he had and he would play it in when we had Home Movie night. Then he would play it in reverse so you could see the mallet airborne, then returning to Tony's hand. Ha, ha! Tony tells the story hilariously. Now, I will tell you this, I can understand his frustration. There is nothing like whacking that ball toward the wicket and it just grazes it and rolls off into an utterly inconvenient direction. The other day that kept happening to me. I lost that game fair and square! I put the "croke" in croquet! But I am looking forward to next time. And there will be a next time. This is the second family picnic we have had and everyone is psyched for another. I will be working on my game. I was sad to hear a few days ago of the passing of Aretha Franklin. She died so young. And it gets me on a personal level, because of the time my path crossed hers. It was a unique encounter! The saga began with a phone interview I did for The Buffalo News. This particular call was an accident. Our pop music critic, Jeff Miers, happened to be on vacation when Aretha's publicist called offering the interview. We did not want to say no to an interview with Aretha Franklin, seeing that she lived in Buffalo as a girl. So I stepped up to the plate. I put myself through a quick crash course on her career -- I was an expert on Leonard Pennario, not on Aretha Franklin -- and then the diva and I spoke. Here is the interview I did. Reading back on the interview I smiled remembering how when I mentioned I played the piano, and began asking her about her own playing, she seemed to relax and brighten. Pianists love to talk to other pianists! But the real fun began afterwards. It was right as I was telling her goodbye -- isn't it funny how that is when people come out with stuff? Aretha began talking about the friends she had as a little girl in Buffalo. She wondered if I could help her get in touch with this family. And so I did. First I put together a story, a kind of shout-out to them. Blassingame, the name was. Subsequently I was able to get a hold of Wayne Blassingame on Facebook. We had a bunch of friends in common and so I was able to message him. Aretha had remembered him as the baby of the family. She had been sort of sweet on his older brother, Gordon. Aretha came to town and as you can see in The News' photos, was delighted that she was able to meet Wayne, who still lives in Buffalo and, may I add, is still my Facebook friend. Meanwhile, I got to talk with Gordon Blassingame. We ran that story under the subtle title, "Aretha Franklin's Childhood Crush Tells All." I believe I wrote that headline. The whole experience really touched me. You could tell Aretha was taking stock of her life. You could tell she was looking back wondering what things might have been like if her life had been different. 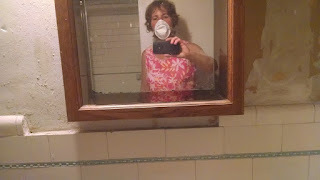 This boy Gordon Blassingame -- well, he was now, like her, in his 70s -- she had tried to reconnect with him a couple of times in his single days, after their paths separated. Once, when she showed up looking for him in a limo, he was out of town. He struck me as a salt-of-the-earth guy, the kind of man every girl would be lucky to marry. He had been in the military, joining the Marines. Then he had settled down to a job in public transit, and retired with what I imagine must be a good pension. He had been married to his wife for 41 years and hoped to top his parents' record of 50 years of marriage. He chuckled that he and his wife joked about Aretha from time to time, affectionately. No wonder Aretha had seen something in him. A celebrity's life can be lonely and I bet you wish for that kind of normalcy, for a good faithful man to stand between you and the world. My Aretha Franklin story did not end when her concert did. 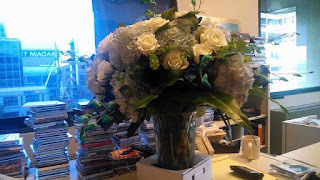 A few days later, this gigantic bouquet of flowers arrived at work. That is the bouquet in the picture at the top! Howard found it. 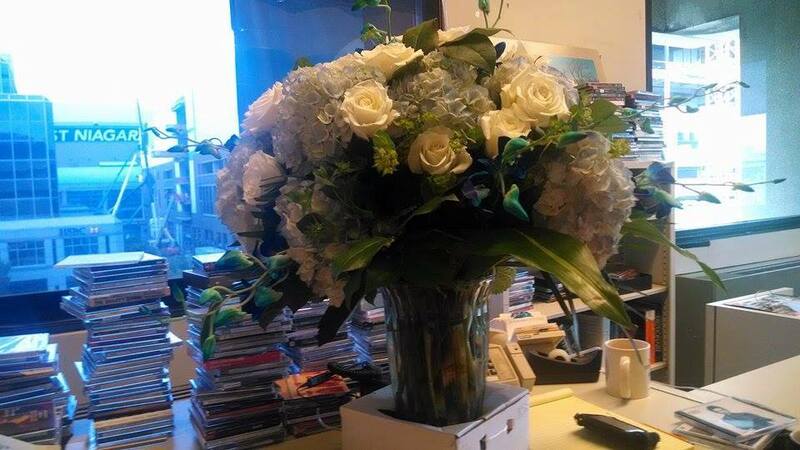 The flowers were from Aretha, with a note thanking me for helping her reconnect with her friends. I think we did an email back-and-forth after that. I know I wrote her to thank her, and she mentioned to me that when she next came to Buffalo maybe I could give her a tour of The Buffalo News. Which, we all would have loved that. But she did not come back here, at least not that she knew. She did come back from time to time, we heard, to visit her mother's grave in Forest Lawn. It got so I liked to go to Forest Lawn too! Too bad we never realized we had that in common. I sort of thought I would get to meet her one day. 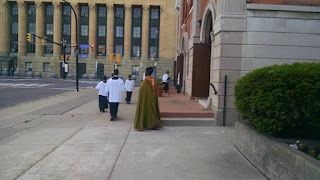 She had invited me to say hello at Artpark, but I think I had to be at the Philharmonic or someplace. Plus I learned a long time ago not really to listen when artists invite you to meet them backstage. Who needs another stranger backstage, you know? And those situations do not bring out the best in me. I still cannot actually name one Aretha Franklin song aside from "R-E-S-P-E-C-T." But I began jokingly to think of her as my buddy. My buddy, Aretha. I said a prayer for her when, in the car, I heard she had died. We should all say our prayers for Aretha Franklin, pray that she makes it to heaven. I have a feeling she will. She was more than the Queen of Soul. She was a gracious lady. One reason I went for that bike ride yesterday was that I was relaxing after my church coffee hour baking. It is hard to believe I have been baking for the coffee hour for two years now. Two and a half years! What is really funny is I still get a real kick out of it. 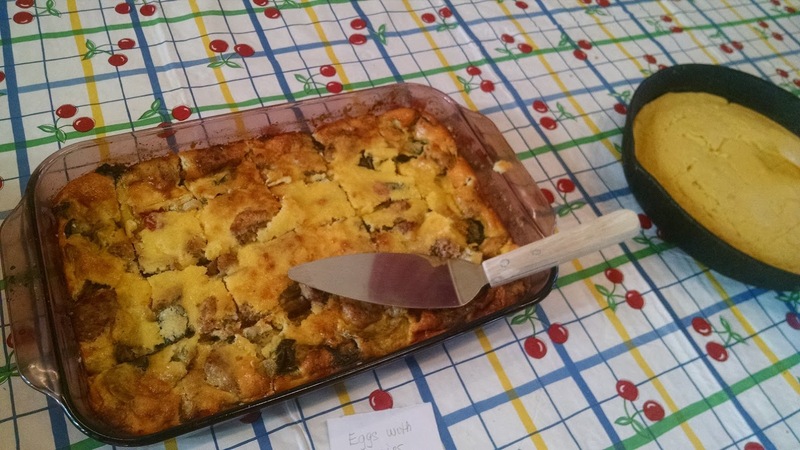 Yesterday my theme was, I was baking out of a cookbook called "Breakfast at Nine, Tea at Four." It is put out by, ahem, the Mainstay Inn in Cape May, New Jersey. ... and my trademark Jackson Pollack coffee wreath pictured way up above. This week I made a chocolate filling. 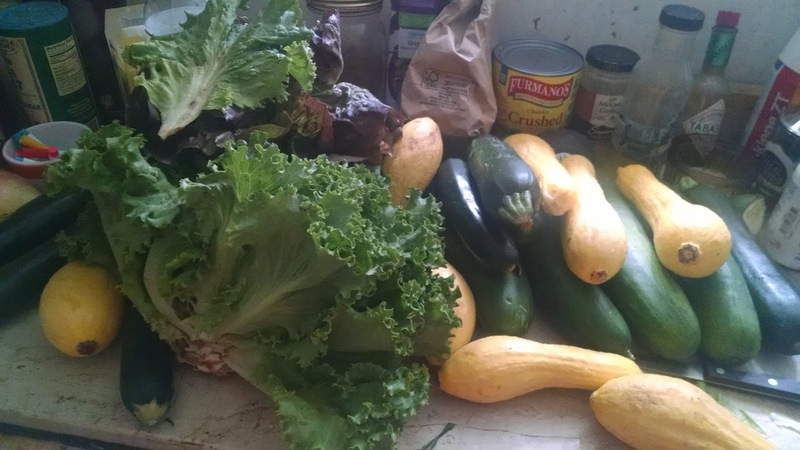 Also on the groaning board were Lizzie's brownies and yummy zucchini bread, and watermelon that our friends Bill and Margaret bought. 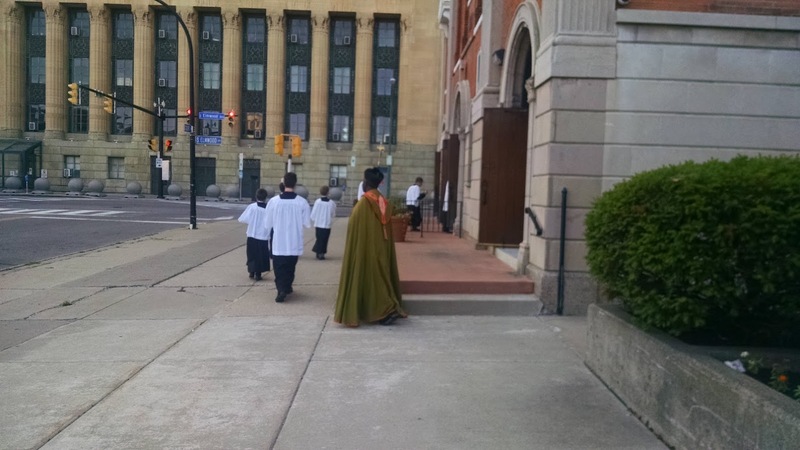 That is life at St. Anthony of Padua's Latin Mass! Every week is like Babette's Feast. Other people bring stuff, too. We do love to eat. Yesterday to the pleasant surprise of Team Coffee, the turnout was great even though it was a summer day and our Latin Mass Picnic was last week so you would have thought people would have had enough of each other for the time being. We went through almost all the food! And my friend Alenka who is from London praised in particular the Orange Kuchen. Alenka does not care for cinnamon and deplores that here in America it is everywhere. 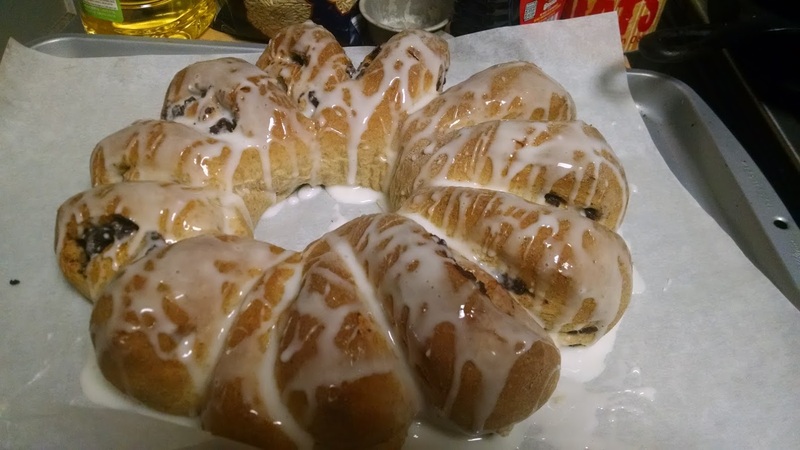 And so I had subbed in allspice for cinnamon in the recipe, all on account of her. I was particularly proud of the eggs because they were a last minute sub for something that, uncharacteristic for me, had not worked out. I threw this dish together and prayed it would bake fast enough to get me to the church on time, as the song goes. ... made it in just before I did, darn. I had to stand back. But still. Such fun, you know? Sometimes at Mass it is hard for me to keep my mind on the prayers because I am thinking about the food. I am not Mary, I find myself thinking on those occasions. This being Sunday when we are supposed to relax and enjoy, I went on an evening bike ride. I love biking through Buffalo's Central Park neighborhood. It reminds me of when I was a kid and used to bike around Snyder, only it is, dare I say, perhaps just a little bit nicer. Vast stretches of it are so quiet, which makes it wonderful this time of year. In August you get the crickets and the cicadas. This evening I pedaled around aimlessly on my Huffy Harvard Limited. Did I tell the story of this Huffy? I do not think I did. I will have to. Anyway, I came to a stop at this idyllic little park where I took the picture above. I always admire this park when I pass it. I keep meaning to stop one of these days, and sit on that bench, and attempt a painting or a sketch. Here is the park from another angle. I was so happy to see the fountain going. 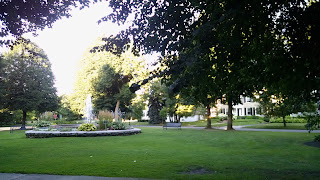 The last couple of times I pedaled past, the fountain was not going, which made me worry. This may be the tony Central Park neighborhood but it is still Buffalo. And in Buffalo when something breaks it takes a long time to fix. So, nice to see the fountain making a splash. And to pedal through the golden streets. Besides being a peddler's helper I am also a pedaler. What a beautiful summer this is! 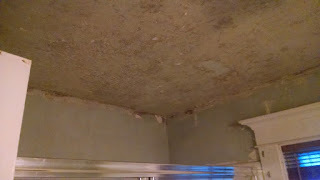 I got tired of the popcorn ceiling in my bathroom so I took it out. 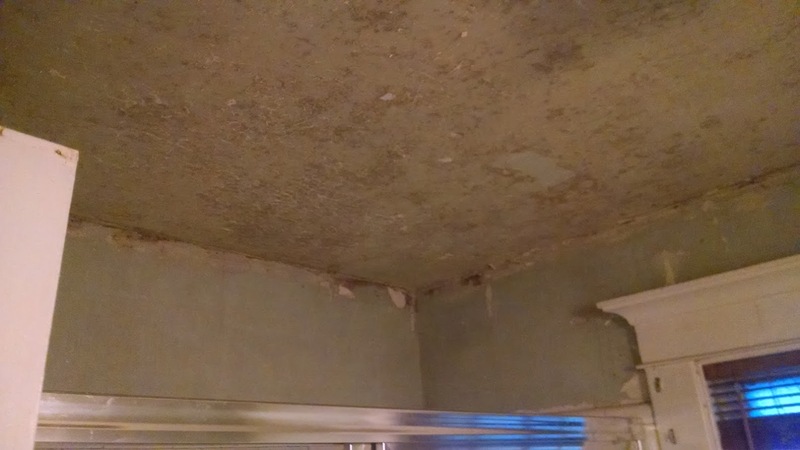 I have read that no one should ever put a popcorn ceiling in the bathroom on account of it is wet in there and the wet brings the ceiling down. That seems to have been the situation in my house. That ceiling was coming down whether I wanted it to or not! There were a number of patches of no ceiling. My sister Katie checked it out and said I could likely remove it with a putty knife. So I decided to do that. Cost of the project: $2. One buck for a putty knife and another for a 10-pack of face masks, both from Dollar Tree. You can also get eye-protecting goggles at Dollar Tree for a buck but I had a pair already from making soap. Did you not know I made soap? There is a lot about me you do not know! Honest, though, I never thought I could take down this ceiling. The secret is just to do it. Do not think too much about what is involved or you will just want to go lie down. It was about 90 degrees. I was scraping away! They are right about you need the goggles and the mask. But it was tough going from time to time and I did not think I would finish. I put a sheet over the sink to catch the ceiling bits. 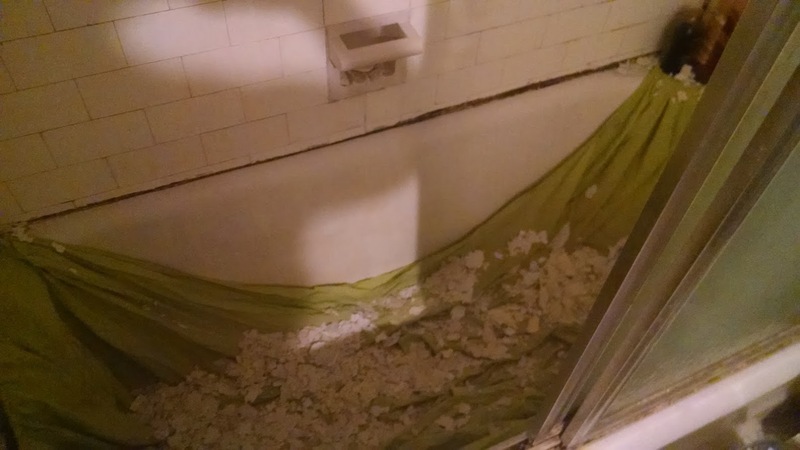 Then I put the sheet over the tub. 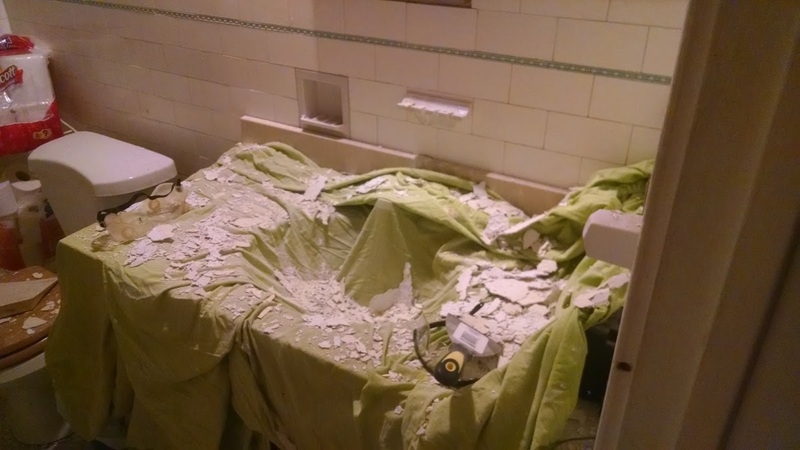 Then things were going well enough so I decided not to give up on the part of the ceiling I had left. So the sheet moved back to the sink. In time it moved back to the tub. I could not complete each section in turn. That is just not how I roll. Several times I even gave up and did a complete clean-up, only to begin again. It was thrilling when I realized I was winning! ... and then I had to take a shower in my cleaned-up tub. Ergo you may take my headline literally. I'm gonna wash this ceiling right out of my hair! That is what I sang in the shower. 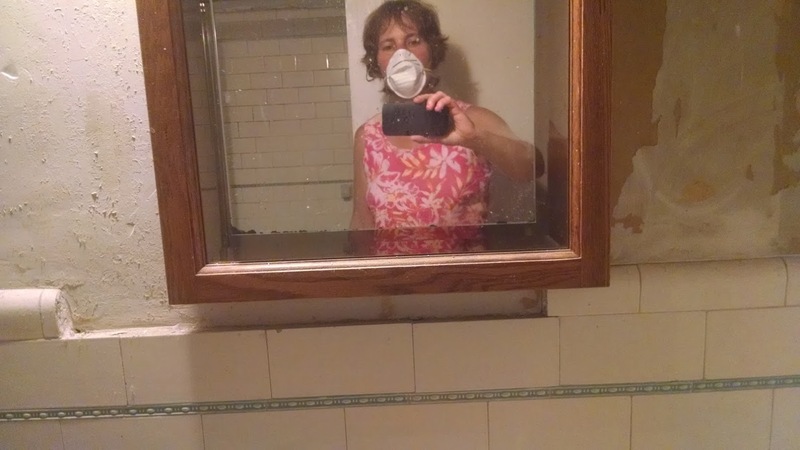 Next comes the task of painting the bathroom. I think I will do the kind of sage green it was so many years ago. The ceiling was the same color and I will do that too. At the top of the post is a picture of the ceiling as it is now, sans popcorn. It is cracked but kind of pretty, you know? Like something you would see in an ancient building in Venice, along with a plaque saying that Wagner wrote "Tristan and Isolde" here, or Leonard Pennario stayed here. Well, OK, you have to use your imagination. I do! But as I said, I never imagined I could do this. And now as a woman I feel very proud. I have shattered the popcorn ceiling!